To create a post simply click on the compose box in the lounge. Give your post a title followed by the body of the post. As a manager you have posting super powers! Yes, announce will post to the feed and get sent instantly via email to everyone in the group. Announcements are also highlighted in the feed with a special announcement badge. No, just post will post to the feed based on the default post settings of your group (Instant email, Daily Digest, or No email). Find the post in the feed that you would like to edit, click on the 3 dots in the top right corner of the post you’d like to edit. Edit your post as you'd like and hit post. 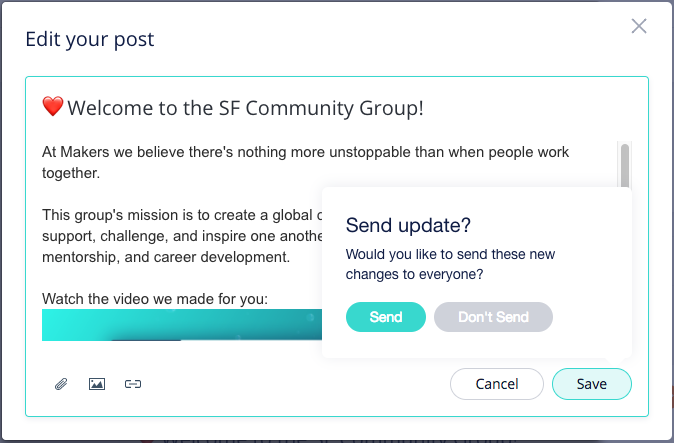 You will again activate your manager super posting power and will have the choice whether to send an update via email or simply modify the post in the feed only. Make your choice and click save. Your changes will be saved. Find the post in the feed that you would like to edit, click on the 3 dots in the top right corner of the post you’d like to delete. Click the delete post option - don't worry it will not delete automatically, you will get a pop up window asking you if you're sure. Remember, the posts will be deleted only in the lounge feed, if you have sent the posts via email they will remain in the email that you have sent. What types of posts are editable? Can other managers edit my Post? Yes. All managers can edit other managers posts. Can managers edit member's posts?